THE WINNERS! 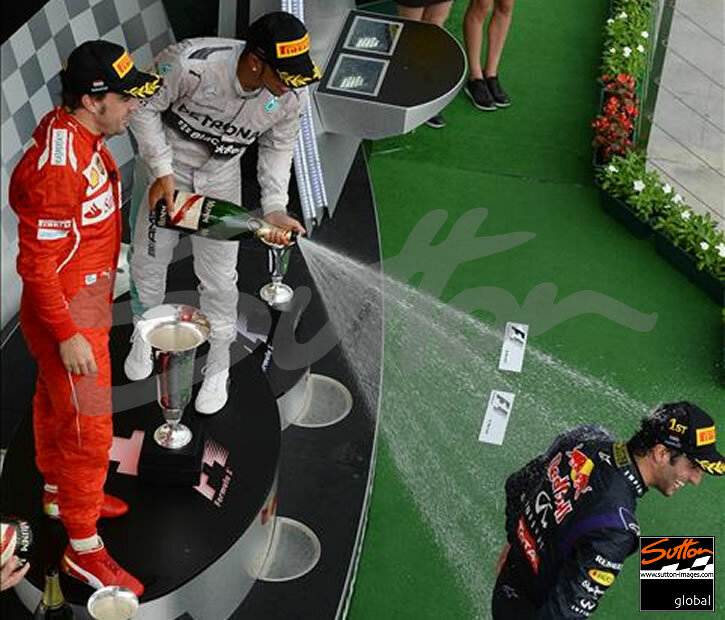 OF THE HUNGARIAN GRAND PRIX 2014 ! Welcome all race fans to our 11th Grand Prix of the 2014 season. The intense battle between Rosberg & Hamilton continues as Lewis Hamilton had a terrible crash in practice at the German GP Hockenheim. This left Lewis Hamilton last on the starting grid but he soon battled to get a 3rd place on the podium to be within only 14 points at this stage of the season behind his racing team partner Nico Rosberg who is flying with performances secure championship leader. Williams have had a great surge with podium points and are looking for Massa to charge forward with a car that is capable of beating the Mercedes AMG teams car. So whilst Mercedes AMG team research the cause for faulty brakes on Lewis Hamilton’s car, Williams are looking to make their cars go that bit faster. The Red Bull Team are still looking to make their Renault engine go faster to catch the Williams and the Mercedes AMG team. whilst the Ferrari team are looking to improve towards their development of their 2015 car and to hold onto places to keep the Force India team and Mclaren team behind them for the rest of this season. Join in on our just for fun ‘WHO’S ON POLE’ feature. Will it be Lewis, Nico or can Williams Valtteri Bottas challenge for pole position. Please Vote who you think will take pole for this weekends Hungarian GP 2014. Simply scroll down this page and look to your right. Remember to follow us now at @johnnyherbertto and keep up-to date with all the action. Please twitter us your comments who you think will be on pole position and who can WIN! this great GP circuit here at Budapest 2014. If you look out for our great motor racing prize draws on our twitter site, Then just simply press “follow us” and your entry into our weekly free prize draws could make one or more of you lucky follow us GP fans winners. 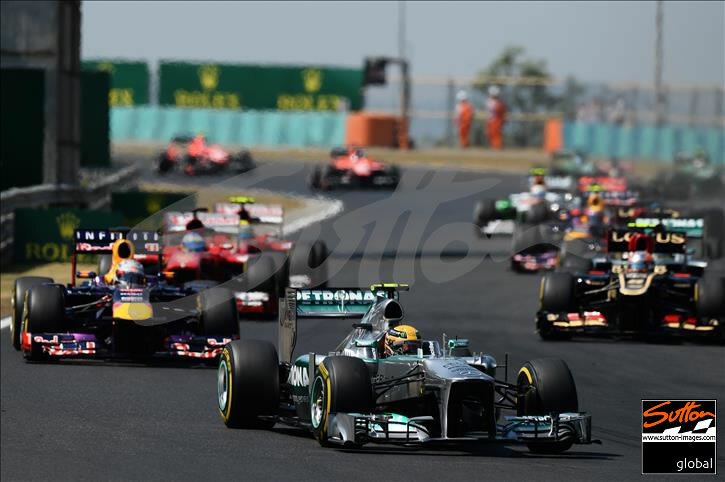 Welcome all race fans to our 10th Grand Prix of the 2014 season. The Gloves are off and with Nico Rosbergs retirement because of a broken gearbox, leaving Lewis Hamilton to win his home GP at Silverstone. The German GP here at Hockenheim will be a fight to remember as Mercedes have come home to win and with Nico Rosberg wanting to win his home Grand Prix as well. Are the politics behind the scenes in the Mercedes AMG Team garage going to favor Nico Rosberg over Lewis Hamilton this coming weekend. Or can Sebastian Vettel and the Red Bull Renault challenge for the lead. This weekend is going to be a big occassion for German sport after last weekend Germany won the Brazilian World Cup 2014. 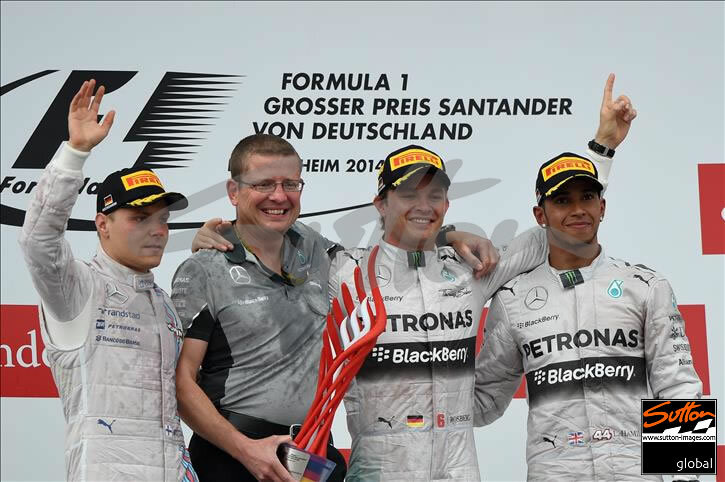 Only pure dominance will be on the minds of the Mercedes AMG Team and their German Driver Nico Rosberg. Join in on our just for fun ‘WHO’S ON POLE’ feature. Will it be Lewis, Nico or can Vettel challenge for pole position. Please Vote who you think will take pole for this weekends German Hockenheim GP 2014. Simply scroll down this page and look to your right. Remember to follow us now at @johnnyherbertto and keep up-to date with all the action. Please twitter us your comments who you think will be on pole position and who can WIN! 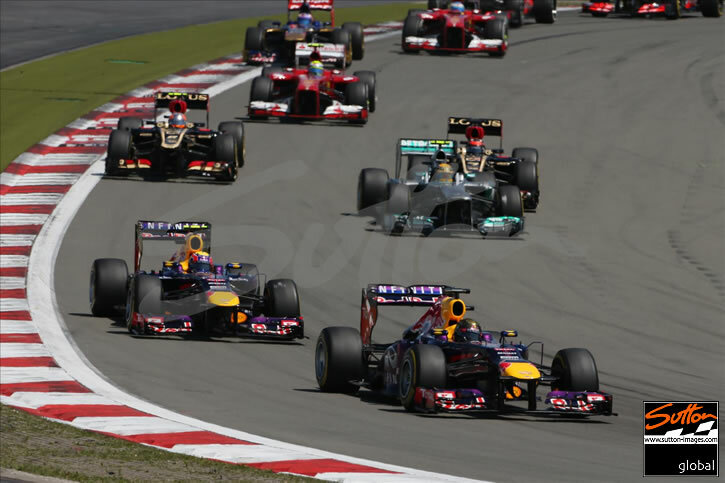 this great street circuit Grand Prix here at Hockenheim 2014. If you look out for our great motor racing prize draws on our twitter site, Then just simply press “follow us” and your entry into our weekly free prize draws could make one or more of you lucky follow us GP fans winners. 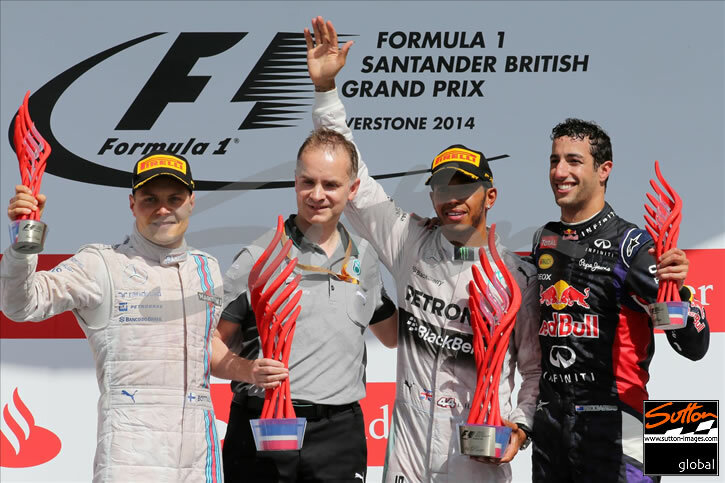 Hi Race fans and welcome to our 9th Grand Prix of 2014 season and the 50th anniversary of Silverstone. 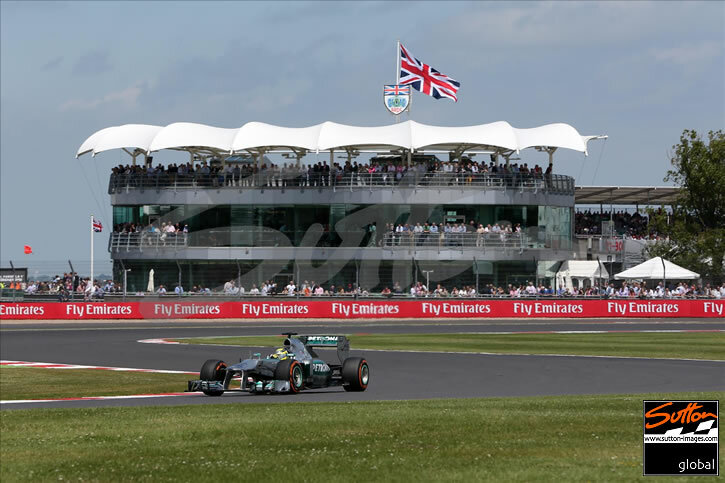 We are in for a real battle of Britain fight for pole position and for Lewis Hamilton to win on British soil would be a dream come true for all British motor racing fans. With Lewis Hamilton having to settle for 2nd place at the Red Bull Ring in Austria. Lewis and the rest of the British drivers will be wanting to make a good impression to all the British crowd. Roll back the days when David Coultard & Jenson Button won here at Silverstone, but more importantly the glory days of Nigel Mansell who had the whole of the United Kingdom driving the car with him to win here against the likes of Ayton Senna. Join in on our just for fun ‘WHO’S ON POLE’ feature. Will it be Lewis, Nico or even can the Great British TeamWilliams to challenge for pole position on the starting grid. Please Vote who you think will take pole for this weekends British Grand Prix 2014. Simply scroll down this page and look to your right. Remember to follow us now at @johnnyherbertto and keep up-to date with all the action. Please twitter us your comments who you think will be on pole position and who can WIN! on this classic circuit where all the greatest drivers in the world has raced. If you look out for our great GP prize draws on our twitter site, Then just simply press “follow us” and your entry into our weekly free prize draws could make one or more of you lucky follow us GP fans winners.